The Orionid meteor shower arises from the Earth’s pre-perihelion encounter with the meteor stream of comet 1P/Halley. The Orionids usually produce good observed rates, especially in the later part of the night. Although some meteor shower listings give a start date in early October, Orionid rates remain very low until the third week of the month. There is no sharp maximum and good rates should be seen during Oct 21-23. The peak ZHR will probably be about 20 but remember actual observed rates depend on sky darkness, moonlight and so on. Strong Orionid activity (ZHRs ~35-80) occurred in the years 2006-2010 inclusive, when such rates persisted for two or more nights at these levels. However, no repeat is expected this time, but surprises can occur. Orionid meteors are typically swift moving, with good persistent trains. Although the Orionid radiant doesn’t rise until around 21h UT (10pm BST) and fewer Orionids will be seen before this time, meteors are best seen by looking 30-45 degrees away from the radiant, and you can often still pick up events before the radiant rises. Furthermore a gibbous Moon rises at around midnight and will drown out the fainter meteors, so its worth going out before midnight. 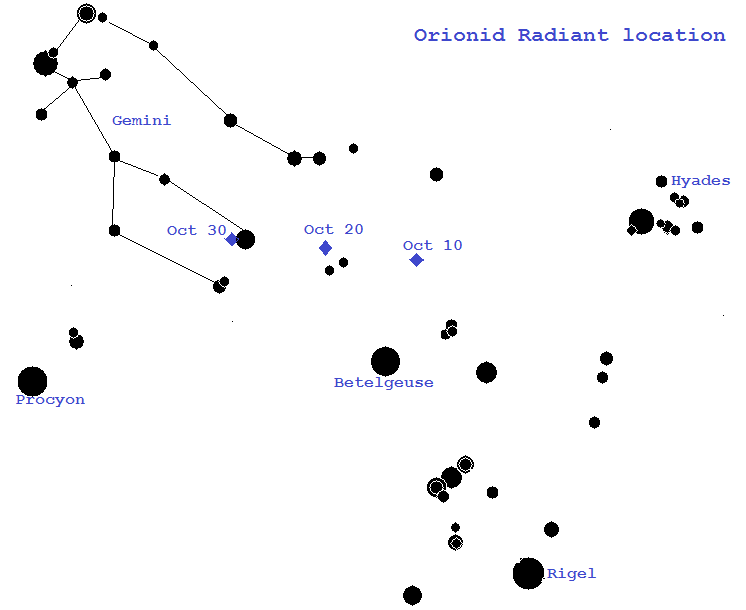 The motion of the Orionid radiant between Oct 10 and Oct 30 is shown on the chart below – note that the radiant lies closer to Gemini than to the main pattern of Orion. Some activity from the Taurid meteor shower will also be visible during Orionid meteor watches.